Jane Yakel, M.S. CCC-SLP, is a certified and licensed (VA #2202005215) Speech- Language Pathologist with over 40 years of experience in the care of persons suffering from neuropathology disorders. Jane is currently a private contractor and consultant in Virginia and has worked in a variety of settings including acute care, outpatient clinics, home health agencies, skilled nursing homes, independent and assisted living facilities, hospitals and schools. She has taught at the University of Wyoming, Utah State University and DeVry University (Phoenix). She has been a regional clinical specialist and a national trainer for rehabilitation program directors and has served as a director of a community re-entry program for traumatic brain injury survivors. She has shared her expertise as an author and presenter at national and state board continuing education courses on various topics including, Prospective Payment System; Medicare Documentation; Ethics and Professionalism; Comprehensive Assessment of the Adult Patient; Quality Indicators: QA / QI; Customer Service; Nursing Documentation; Managing Dysphagia as well as Cognitive Communication Disorders in the Neurological Impaired; Cognitive Rehabilitation and Dementia. 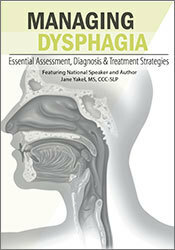 Jane is the author of two comprehensive manuals and informative guides in the field of Dysphagia and Cognitive Rehabilitation. Jane’s book on Dementia: Interventions for Severe Cognitive Impairments gives detailed intervention strategies for professionals working with patients who suffer from significantly decrease cognitive status. The book is tailored for multiple disciplines within the healthcare field as well as caregivers. Jane is a member of the American Speech-Language-Hearing Association, served as a representative for the People to People Ambassador Program for America Speech and Hearing Association and is a prior member of the Wyoming Board of Examiners for Speech-Language Pathology and Audiology. She completed her undergraduate and graduate studies at the University of Wyoming, specializing in neuropathology. Jane currently owns ProStar Communications, LLC, a professional communications company, and Yakel Educations, LLC, a professional publishing company. Financial: Jane Yakel is the owner of ProStar Communications, LLC and Yakel Educations, LLC. She receives a speaking honorarium from PESI, Inc. 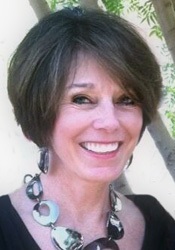 Non-financial: Jane Yakel is a member of the American Speech-Language-Hearing Association. 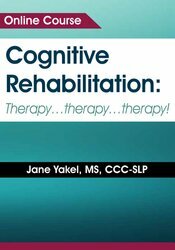 Cognitive Rehabilitation: Therapy ... Therapy ... Therapy!! !